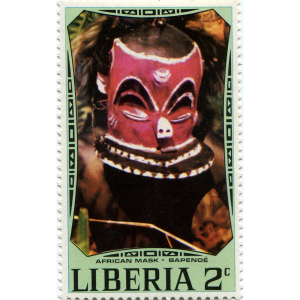 This stamp is one of a set of eight celebrating traditional masks of African peoples, none of which strangely is found in Liberia. This stamp depicts a mask from the Eastern Pende (Bapende) ethnic group of the Democratic Republic of Congo (formerly Zaire). The mask is a panya ngombe, representing a buffalo, an animal associated with dignity and authority. 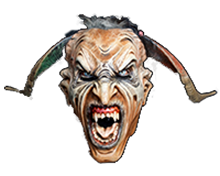 Such masks could belong solely to chiefly lines and were used at adult initiation of boys after their circumcision.